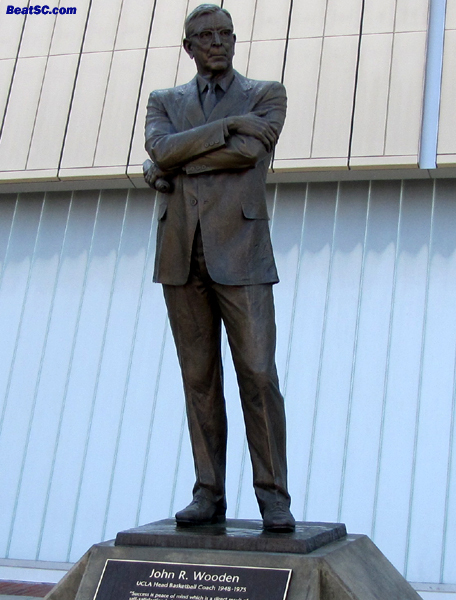 I’ve been so busy, working 70-hour weeks and getting tons of calls needing help during my “off” days, I hadn’t had a chance to see New Pauley until Friday. I have this week off for Thanksgiving (although the calls asking for work help never seem to stop), so when UCLA offered me (as a Football Season Ticket holder) FREE TICKETS to the UCLA-Notre Dame Women’s Basketball game, I took them up on their offer. I’m not a huge Women’s Basketball fan, but I wanted to see Pauley, I wanted my Wife to see Pauley, and I was hoping that some of the Spirit Squad would be there as well. On that count I lucked out, as 10 of the 11 Dance Team girls were indeed in attendance, performing. 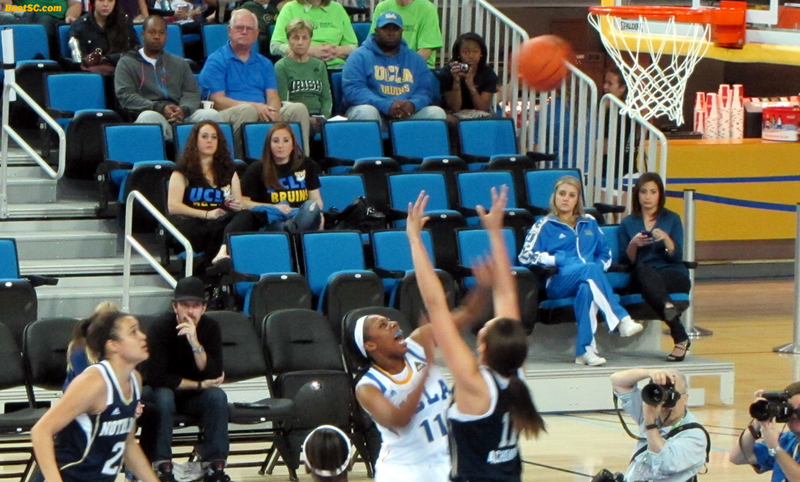 The game itself was not great, as the #7 Fighting Irish handled the #19 Bruins fairly easily. UCLA got off to a 6-0 lead, and held it for about 12 minutes, but then Notre Dame asserted themselves, and led by double-digits most of the rest of the way. 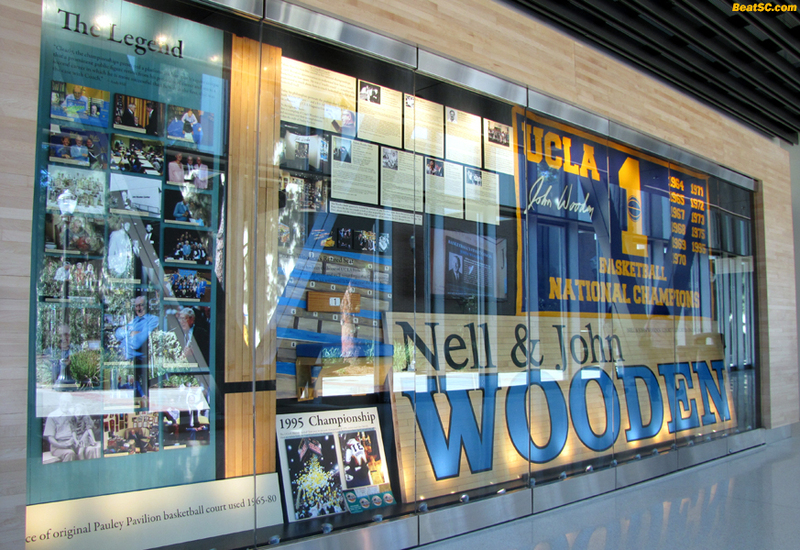 But at least I got to see the refurbished Pauley Pavilion, and the world-class Dance Team in action. Pauley is nice, and definitely improved, but nothing spectacularly different. It is cleaner and brighter, with fresh paint, new seats, and cupholders. Areas above the seats are freshly-painted gold, to replace the cement-gray. There are more bathrooms, more concessions, a gift store, a coffee bar (which was closed on Friday), and several museum-like displays celebrating UCLA, John Wooden, and Pauley’s history. Like I said, it is very nice, but I can understand why some people won’t understand where all the money went. A lot of it went into “invisible” infrastructure, like electrical, and piping, and earthquake safety, etc. 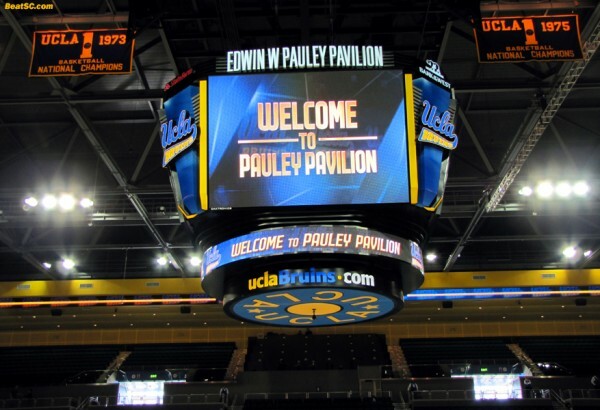 After you take in the bigger scoreboard and wraparound display boards (advertising space, mostly), it is still a very similar Pauley. Luckily, I like origianl Pauley, so I’m not disappointed in the lack of upgrades and changes. But some people will be, and I understand their concerns… I just don’t share them. The highlight of the arena experience for me is still the Spirit Squad. Because of the tiny Women’s Basketball crowd, and because we were literally the first fans to enter the arena, I had great, center court seats — Front row of the general admission (middle) section. Since the lighting is brighter than before, the photos came out not too bad while the girls were on the court. When they were on the sidelines, the light was not as good, so those photos are a little grainy… but still worth sharing. So here are 50 photos from my first trip to the Remodeled Pauley Pavilion, mostly of the UCLA Dance Team, who need no revamping at all. "RE-VAMPED" was published on November 24th, 2012 and is listed in News from the Dark Side.